Fatboy’s Doggielounge offers your canine friend a stylish and cosy spot for relaxation. Made of moisture- and dirt-repellent nylon, the cover of the dog bed is easy to clean with soap and lukewarm water. What’s more, the polystyrene bean filling supports the dog’s body by conforming to its shape. 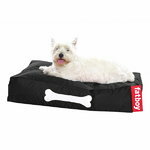 The durable Doggielounge bed is available in two sizes and features a fun bone motif.